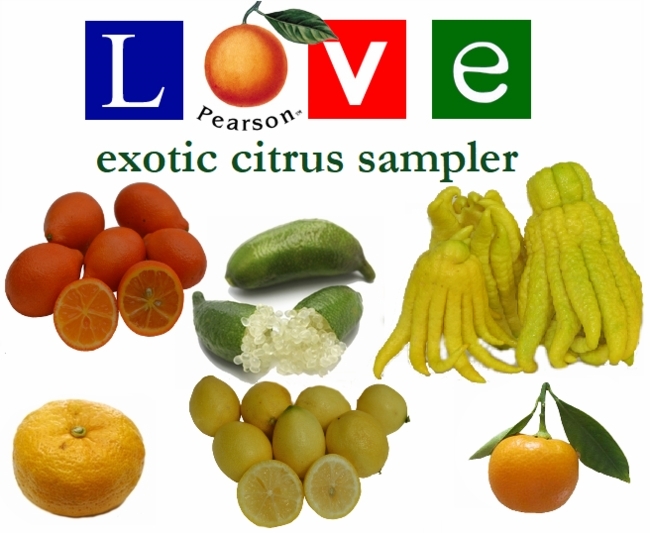 Looking for a variety of exotic citrus fruit in a delicious and unique sampler box? Pearson Ranch has your fruit! Depending on the season and availability, we will ship you a 5 pound mix (our choice) of our more "delicate" specialty citrus. We call them delicate because they tend to be smaller pieces of fruit with a thinner rind than an orange or lemon, but boy do they pack a BIG amount of flavor in each piece. Items can include: Finger Limes, Yuzus, Mandarinquats, Limequats, Centennialquats, Calamondins, Fukushu Kumquats, and Buddha Hand Citron. If you've already tried some of these exotic citrus fruits, then you already know how they can add an incredible and unique splash of flavor to some of your favorite dishes. And if this your first foray into the wold of exotic citrus fruits, be prepared to be amazed! So open up your favorite cook book or download your those recipes you have been waiting to try and unleash the citrus "magic" in your kitchen! These exotic citrus fruits come in 5 pound quantities. The actual number of pieces in the box will be determined by which fruits are being packaged at the time of order fulfillment.